News arrives of a major €1,025,000 price cut from Michel Chryssicopoulos at Cape4 Yachting on the 41.3m motor yacht Ouranos Too, a joint listing with Richard Earp at Fraser Yachts. Built by Codecasa in 1994 and refitted in 2007, Ouranos Too accommodates 12 guests in a master suite, three double and two twin cabins. Special features include a home theatre and recording studio on board, and there’s a spa pool on the sun deck. 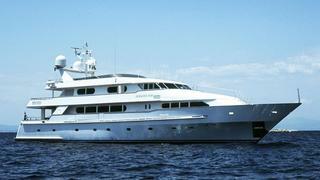 The yacht’s twin 2,250hp MTU engines give her a cruising speed of 15 knots. Located in Athens, Ouranos Too is down from €4,975,000 to €3,950,000.